Beets is my favorite veggie, infact our favorite veggie. I love to make Beets thogayal atleast twice a month and beets lassi whenever i feel like having a chilled drink. At home, my younger one loves the beets rasam and beets pachadi. Even my elder one who doesn't prefer beets curry much, loved the beets croquettes, which i made last week. So, while deciding dishes for the colorful dishes theme, i wanted to do this beets labneh too. Labneh is a soft cream cheese made of hung yogurt. I already have a spiced labneh in my kitchen, this beets and chili labneh is another wonderful additon. I served this with some chapathi to my younger one for dinner, he loved it. My elder one has asked me to make some sandwich with it for his snack tomorrow. A simple recipe, that will be ready when you are asleep, yup leave it to drain overnight in the fridge, you will have a creamy condiment for breakfast the next day. Peel and cook the beets in the microwave or stove-top until soft. 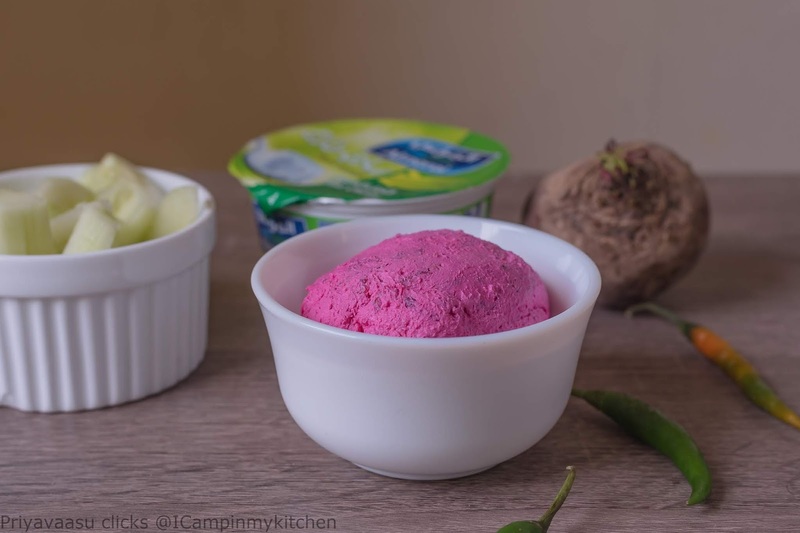 You can also use it raw, but since both my kids love labneh, i didnt want them to be put off by raw beets, so i cooked them soft. Do not waste the water in which the beets were cooked, use it make rasam or cook your dal. Once beets cools down, grate it fine. In a bowl , take the grated beets, chopped green chili, dump the yogurt, and salt. Give it a good mix. Pour the yogurt in a cheese cloth, tie on top, place it on a sieve and let it sit overnight or atleast 6-8 hours and drain off all the whey. Take it off the cheese cloth, and serve it along roti's, bread and your veggies. That is such a wonderful, colorful condiment! I recently made beets rasam and totally loved it. Will check your version as well. Such a pretty looking labneh Priya. Such a great idea to add beets - so colorful and delicious. Wow! 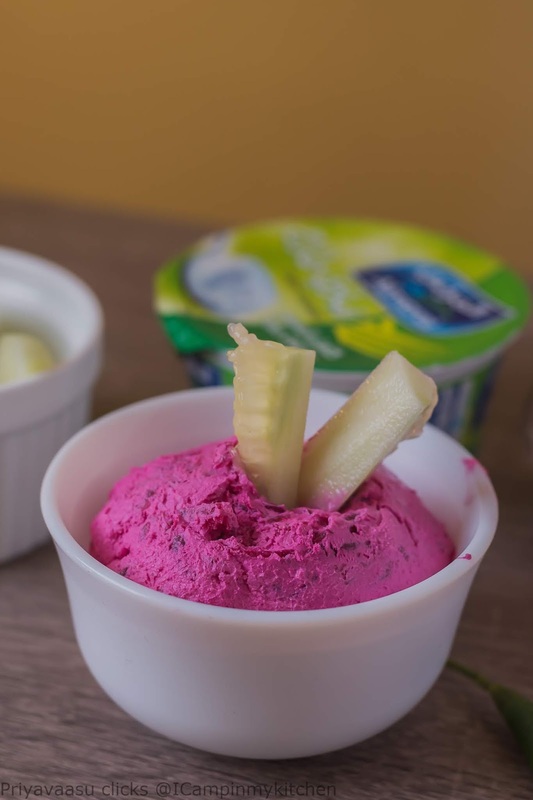 Such a colorful labneh you showcased. Very appealing one. 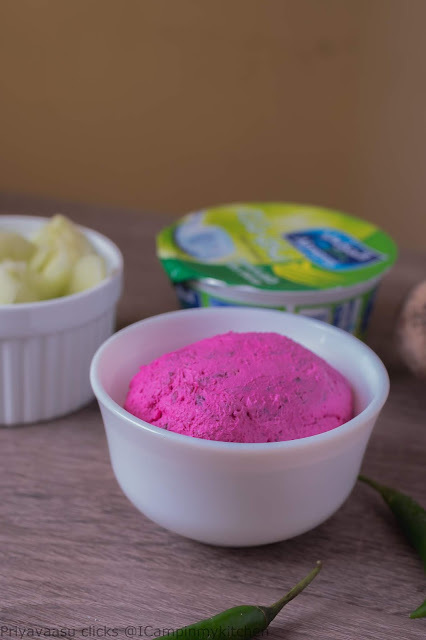 Very vibrant and eye pleasing labneh, pretty incredible labneh there. I love labneh ever since I tried it. This version with beets looks so colourful and I am sure it tastes fantastic. Fantastic one Priya, the flavours must have been awesome. on the bread it will taste so yummy!.. Omg!! Look at the colour! It's so bright and feels appetizing. Yum. wow this is superb, surely a yummy condiment with dry snacks or simply cut veggies. Loved this beautiful color.